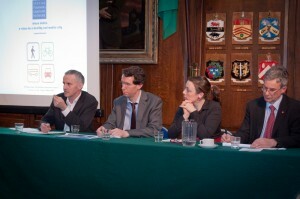 The Spatial Planning Graduate Network held its 3rd Planners Forum, a panel discussion on the topic a�?Future Dublin a�� A vision for a Healthy and Mobile Citya�� at the Mansion House, Dawsona��s Street on the afternoon of Friday, 2ndMarch 2012. 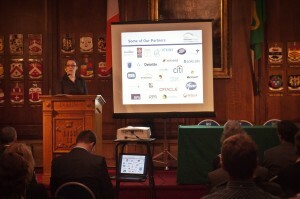 The guest speakers were Cllr Andrew Montague (Lord Mayor of Dublin), Brendan Finn (Independent Transport Consultant), John Oa��Hara (Deputy City Planner for Dublin City Council), Owen Shinkwin (Senior Planner in the National Transporta��s Integrated Planning Section) and Arlene Finn (Programme/Coordinator Smarter Travel Workplaces Programme). 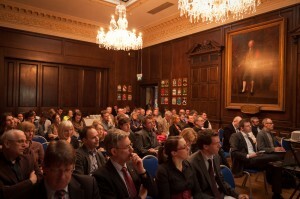 An informal debate with the Spatial Planning Graduate Network and guests took place following the formal presentation from each of the guest speakers. 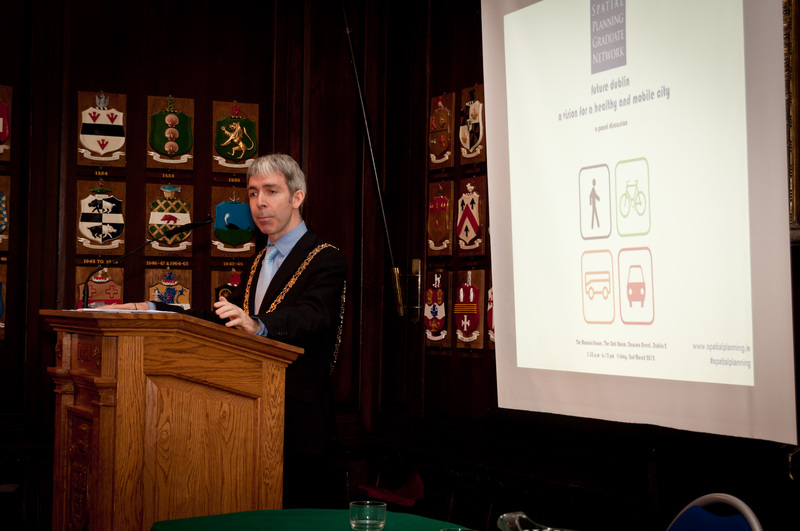 David Oa��Connor, Chairperson of the SPGN, and lecturer in Transport Planning and Urban Design in Dublin Institute of Technology welcomed the guest speakers and the Graduate Network and gave a brief outline of improvements in Dublina��s mobility options over the past few years and his aspirations for Dublin to become a city that is healthier to live in and easier to get around, for everyone.A� The city-region is truly at a vital turning point and has important investment decisions to make about transport and mobility.A� The right decisions will lead to a healthier and more mobile city for all.A� These may not even be the most expensive solutions, nor take longest to deliver.A� The Forum panellists were invited because they each represented or wanted to talk about a transport idea that will inevitably be important for the future. Former Minister of State for Sustainable Transport and Planning, Ciaran Cuffe who is a lecturer in Urban Design at Dublin Institute of Technology, acted as moderator for the event. 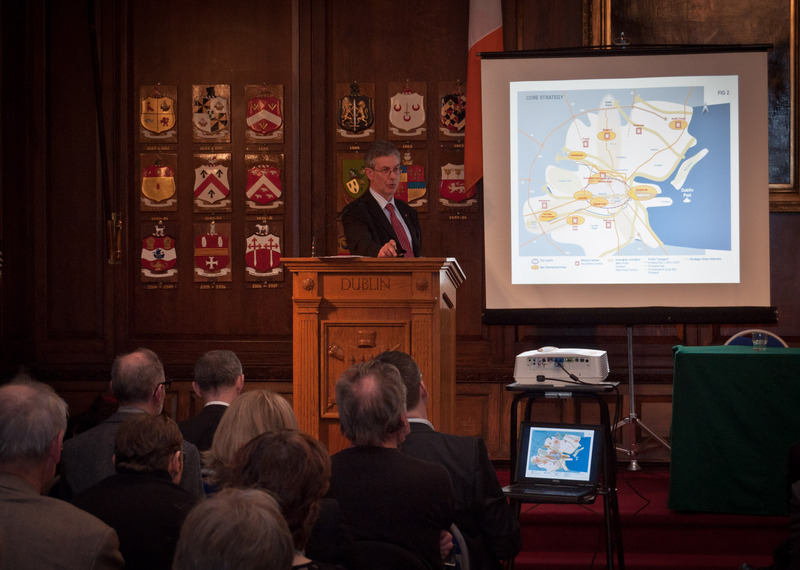 Lord Mayor of Dublin, Andrew Montague opened the discussion by first welcoming the audience to his home in the Mansion House. He spoke of the mobility achievements in the city over the past few years, which included Dublin Bikes Scheme, the appointment of Dublin City Councila��s first Cycling Officer, the introduction of 30km city centre speed limit, the taxsaver cycle scheme for employees and the 70% reduction in road traffic fatalities since 2009. The Dublin Bikes scheme, despite initial resistance, has been successful far beyond forecasted levels. Since the scheme was launch in 2009, there have been over 4 million bike trips taken on the 550 bikes in operation to date. Due the schemea��s incredible success, plans are now in place to extend it over the next 5 years to over 5,000 bikes. Cycling is now the fastest growing form of transport in Dublin. Since 2004, cycling has steadily increased year on year with participation doubling in the last 7 years. The number of cyclists in Dublin now exceeds the number of Luas users on a daily basis. Unlike Amsterdam, where cycling is segregated from motorised traffic, Dublin still has much work to do to make cycling safer and more attractive to all. The Mayor emphasised that a lack of funding shouldna��t be a barrier to successful mobility schemes and we should be inspired by the success of the Dublin Bikes scheme. He closed with some food for thought: people who cycle have 10 extra healthy years of life. 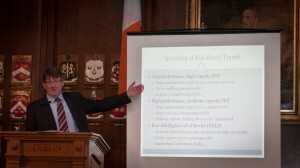 Brendan Finn is an independent transport consultant and leading expert in Bus Rapid Transit (BRT). In his presentation he argued that high quality buses are a viable alternative to rail and tram as a means of moving large numbers of people throughout a city. His studies of other cities throughout the world show that BRT is an efficient and reliable urban transport solution. BRT is also more flexible than rail and tram in terms of opportunity for a greater number of routes, stops and speeds. He stated that too often buses are dismissed before they even reach feasibility study stage. This is a mistake based on incorrect assumptions about buses. One of these assumptions is that car-users will not convert to bus use. He demonstrated with examples of BRTa��s in other cities such as Istanbul and Mexico City that car users will become bus users when buses are of high quality and provide speed, reliability and comfort. 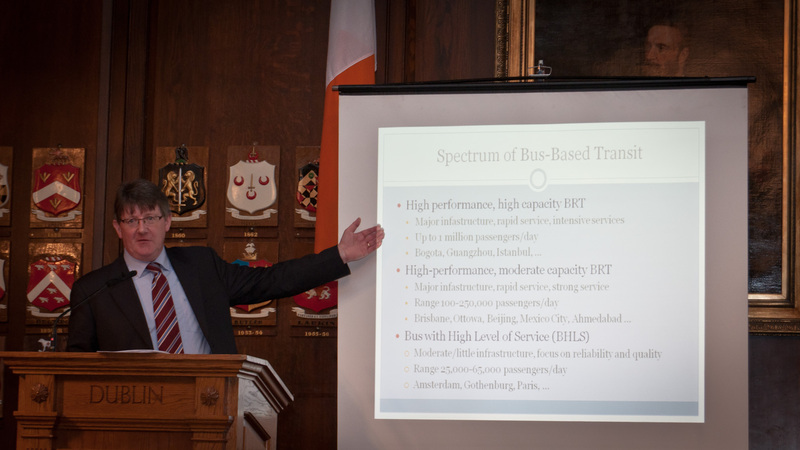 Dublin urgently needs an urban orbital transit route and he urged planners to consider BRT, which is a low cost, flexible option that could be rolled out quickly and incrementally. John Oa��Hara, Deputy City Planner for Dublin City Council (DCC), introduced us to Dublina��s Future Green Network. This is DCCa��s contribution to making Dublin a safer and healthier place to live in The plan is to introduce green corridors throughout the city over a 20 years period. These green corridors will make the city more attractive for people to cycle and walk on a daily basis. The first stage of the Network has already commenced with the completion of a green corridor along the Grand Canal from Grand Canal Square to Portobello, which has an off-road cycle track and a pedestrian walkway, segregated from motorised traffic. Mr Oa��Hara showed the startling link between obesity and travel modes. In countries such as the USA where obesity is prevalent, cycling and walking are the least favoured modes of transport unlike Switzerland where the opposite is the case. Ireland was second only to the USA in terms of obesity and the need to promote healthier travel options, particularly for those who commute less than 5km a day, was emphasised. He also stressed the need for inter agency cooperation. 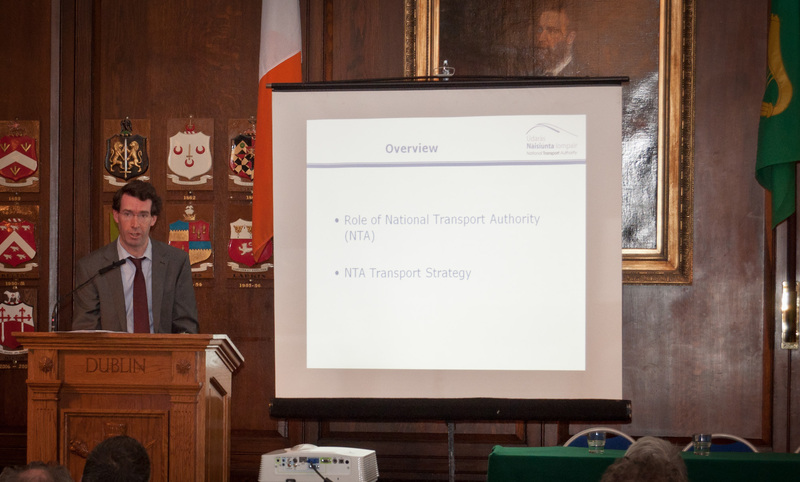 Owen Shinkwin, Senior Planner in the National Transport Authority’s Integrated Planning Section explained the NTAa��s role in providing transport integration in the Greater Dublin Area and outlined the Draft Transport Strategy, 2030 Vision. 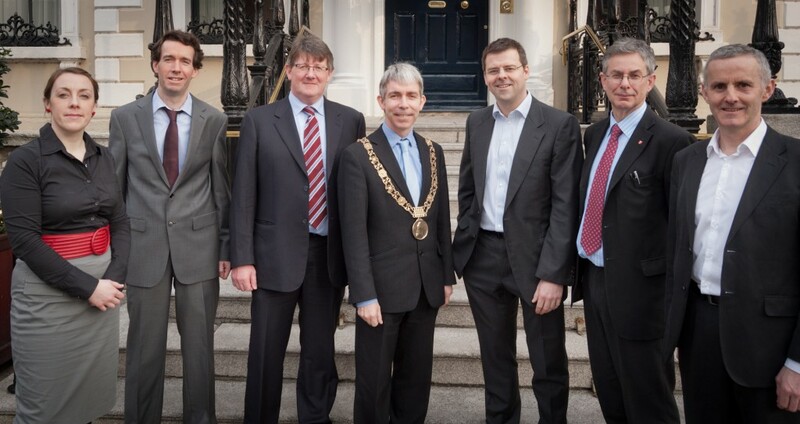 The NTA was established in 2009 and has responsibly for public transport services, capital investment and traffic management policy in the Greater Dublin Area as well as nationally. Mr. Shinkwin gave a comprehensive overview of 2030 Vision, which is a 20-year plan for the Greater Dublin Area. It aims to provide joined up transport and land-use planning, better and easier-to-use public transport and enhanced walking and cycling environments. The final guest was Arlene Finn, Programme Developer and Coordinator of the Smarter Travel Workplaces Programme who has responsibility for implementing Workplace Travel Plans (WTP) for large employers (250+ staff) in Ireland.A� She said that businesses would not participate in the programme if it did not make good business sense, whether it be for parking management issues, planning permission requirements, cost savings, or environmental management. WTP are a package of measures to encourage people to walk, cycle, use public transport, car share or reduce trips through a�?Smarter Workinga��. When implemented by a company, results have shown WTPs can reduce car use by 10% – 24%.A� By simply making staff aware of alternative travel options such as bus routes, car pooling, walking times and the health benefits, they will change their travel behaviour. 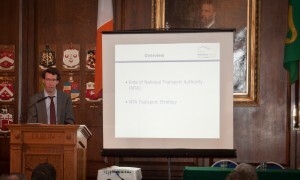 Following presentations from the guest speakers, the floor was opened up for questions and a lively informal debate took place.A� Topics raised included the need for more cycling officers, bike safety training, the need to address public transport deficiencies in poorer areas such as Blanchardstown and how Local Transport Plans would be integrated into Local Area Plans. The Spatial Planning Graduate Network owe their sincere thanks to the following individuals and organisations: Norton UDP for sponsorship of the event. A�Documentary Director Paddy Cahill (www.paddycahill.com) videoed the event. A�BSc graduates Colin Broderick (www.dt106ers.com) and Grace Howell assisted with photography and note-taking respectively. This entry was posted in Uncategorized on March 15, 2012 by David O'Connor.